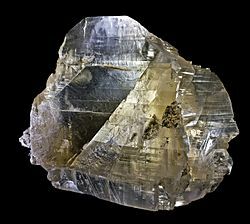 Gypsum is a common mineral, calcium sulfate. Gypsum has been used as a building material for a long time, possibly since the neolithic. Today, it is an ingredient of plaster. It can also be used as a fertilizer. Commercial quantities of gypsum are found in the cities of Araripina and Grajaú in Brazil; in Pakistan, Jamaica, Iran (world's second largest producer), Thailand, Spain (the main producer in Europe), Germany, Italy, England, Ireland, Canada and the United States. Large open pit quarries are located in many places including Fort Dodge, Iowa, which sits on one of the largest deposits of gypsum in the world, and Plaster City, California, United States, and East Kutai, Kalimantan, Indonesia. Several small mines also exist in places such as Kalannie in Western Australia, where gypsum is sold to private buyers for additions of calcium and sulfur as well as reduction of aluminum toxicities on soil for agricultural purposes. Crystals of gypsum up to 11 m (36 ft) long have been found in the caves of the Naica Mine of Chihuahua, Mexico. The crystals thrived in the cave's extremely rare and stable natural environment. Temperatures stayed at 58 °C (136 °F), and the cave was filled with mineral-rich water that drove the crystals' growth. The largest of those crystals weighs 55 tons and is around 500,000 years old. Gypsum board is primarily used as a finish for walls and ceilings, and is known in construction as drywall, wallboard, sheetrock or plasterboard. Gypsum blocks are used like concrete blocks in building construction. Gypsum mortar is an ancient mortar used in building construction. Plaster ingredients are used in surgical splints, casting moulds and modeling. Fertilizer and soil conditioner: In the late 18th and early 19th centuries, Nova Scotia gypsum, often referred to as plaster, was a highly sought fertilizer for wheat fields in the United States. 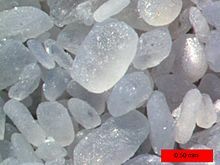 It is also used in ameliorating high-sodium soils, such as in the Zuiderzee Works. As alabaster, a material for sculpture, it was used especially in the ancient world before steel was developed, when its relative softness made it much easier to carve. A wood substitute in the ancient world: For example, when wood became scarce due to deforestation on Bronze Age Crete, gypsum was employed in building construction at locations where wood was previously used. Used in baking as a dough conditioner, reducing stickiness, and as a baked-goods source of dietary calcium. The primary component of mineral yeast food. In the medieval period, scribes and illuminators mixed it with lead carbonate (powdered white lead) to make gesso, which was applied to illuminated letters and gilded with gold in illuminated manuscripts. Tests have shown that gypsum can be used to remove pollutants such as lead or arsenic from contaminated waters. Green gypsum crystals from Pernatty Lagoon, Mt Gunson, South Australia - its green color is due to presence of copper ions. Gypsum Facts for Kids. Kiddle Encyclopedia.